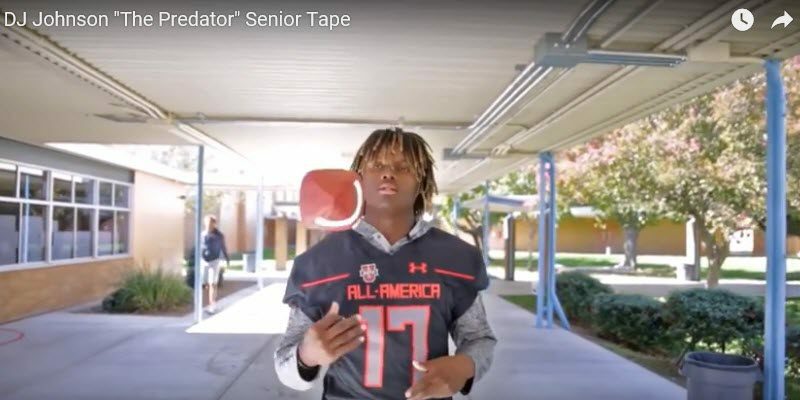 The Oregon Ducks were an also ran in the 2017 recruiting cycle sweepstakes for Deonte “D.J.” Johnson, along with 98 other schools. 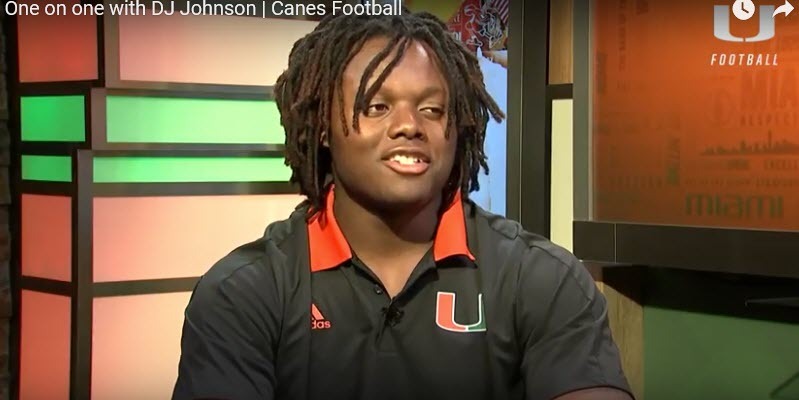 Johnson a hybrid outside linebacker/defensive end, committed to the Miami Hurricanes on July 25, 2017 over other finalists Washington, Utah, and USC. Johnson, from Luther Burbank High School in Sacramento, California was a Top-100 player according the recruiting website ESPN.com. He put up jaw-dropping statistics in 33 high school games, including 225 total tackles (124 solo and 101 assists) and 79 tackles-for-loss (TFL). He brought pressure from the edge with 38.5 recorded sacks and 79 hurries on opposing quarterbacks. And when he arrived he was a wrecking ball, creating 12 forced fumbles and recovering 7 of them. And that’s only on defense. He also chipped in 17 receptions for 255 yards and two touchdowns as a receiver according to Maxpreps.com. D.J. 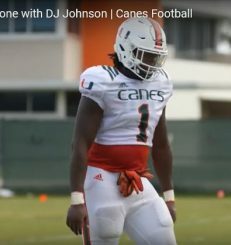 Johnson played as a true freshman at Miami. He appeared in eight games and recorded three tackles for 10-3 team that finished the season ranked in the Top 10 but lost to Wisconsin in last years Orange Bowl. 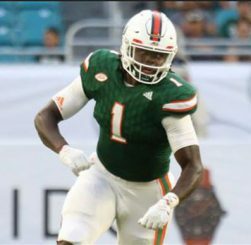 However, it appears distance from home weighed on Johnson as he sought and was granted permission to leave the Miami prpgram. The University of Oregon made the “short list” of eight schools that Miami granted permission for Johnson to speak with. This time, the Ducks went from an also ran to the winner as Johnson elected to transfer to Oregon on January 9, 2018. DJ Johnson was listed by various media sources as 6-foot-5 and 240 pounds in his final year of high school. Due to natural growth from maturity he has put on more weight. One source, SBNation.com, states that he is 6-foot-5 and 270 lbs. 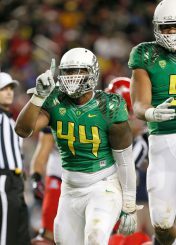 However, the official Oregon athletic site GoDucks.com lists him at 6-foot-5 and 256 lbs. I haven’t seen any evidence that he ever participated in a sanctioned event where he was officially measured and tested. And he was not on the roster for The Opening 2016. None of his recruiting profiles reflect testing results for Speed, Power, Agility, Reaction, and Quickness (SPARQ). Johnson did however participate in Track and Field at LBHS, and it gives us some clues about his athleticism. He had personal records of 11.22 in the 100 meters, 47’1 in the shot put, and 19’8 in the long jump. These are very good numbers for a kid of his size and age. 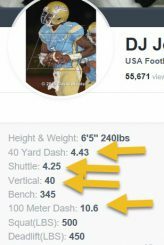 His Hudl.com profile lists his (unverified) 40-clock at 4.43, which I doubt. He also lists a 10.6 100 meters, 4.25 20 yard shuttle time, and a 40″ vertical jump. These are numbers that you would see at an NFL Combine for an elite 6-foot and 195 lb. cornerback, not a 6-foot-5 high school kid who weighs 240 lbs. and is not quite eighteen years old. I’m not saying it can’t be done, it’s just highly unlikely. Many of these “unverified” profile numbers from recruits are embellished, and some are more than others. I haven’t seen any information as to arm length or hand size on Johnson. However, for similar sized athletes (DeForest Buckner, Taco Charlton, Preston Smith and Tarell Bashem – see below), an arm length of 33-1/2″ to 34-1/2″ and a hand size of 9-3/8″ to 10-3/8″ is average. Johnson has the frame at 6-foot-5 to carry more functional weight than what he currently carries. He appears to lack the natural ability to hip sink and change direction to mirror twitched up athletes in space. This ability to move laterally is a must for an outside linebacker. I saw no evidence that he can bend and flatten around the arc either. He appears to be a defensive end or “5-Technique” in a 3-4 (two gap) scheme. Based upon his length and body type he projects to weigh in the 270-290 lb. range when fully developed, with high end (borderline elite) straight-line speed and sufficient power to set an edge. Above, Johnson chases down the wide receiver and “tomahawks” the ball, causing a fumble against Northern California powerhouse Folsom High School. Johnson flashes a fast first step on his way to sack of the quarterback. One of over 38 he had in his high school career. Johnson shuts down the run in the videos above. Again, Johnson demonstrates his forte…run support. And his senior clips show improvement from his junior year. Johnson sacks the quarterback and causes a turnover in the video above. Johnson chases down the running back on the backside of the play against arch-rival Grant High School, another Northern California football powerhouse. DJ Johnson (No. 1 above) played in the ACC Championship game against Clemson on December 2, 2017. He recorded one tackle on this play in run support as Clemson cruised to the win. DeForest Buckner, who played defensive end at Oregon from 2012-2015. Buckner was the San Francisco 49’ers first round draft choice (No. 7 overall) in 2016. One of the most productive and decorated Oregon football players and arguably the best defensive lineman in school history. Other players of similar triangle numbers and talent are Taco Charlton, who was selected in the first round (No. 28 overall) by the Dallas Cowboys in 2017, Preston Smith, who was a second round pick (No. 38 overall) of the Washington Redskins in 2015, and Tarell Bashem, who was drafted by the Indianapolis Colts in the third round (N0. 80 overall) in 2017. In the clip above, Buckner chases down the quarterback. This video is very similar to much of DJ Johnson’s highlight videos from high school. DJ Johnson has the power/speed skill set to be an effective 5-Tech when fully developed. He has the length (6-foot-5) and long arms to control two gaps (or one gap as the scheme dictates) and the athleticism to play heads up with an offensive tackle. He has the power to rock an opponent off his anchor, and that will improve as he gains more weight. He sheds blocks much like you would see a premier high school player without a variety of advanced moves. He solo and gang tackles equally well, smothering the target with a wingspan approaching 7 feet. He flashes advanced range and the ability to “run down” twitched up running backs and wide receivers with build up speed. I doubt that his future is as a stand-up outside linebacker. He doesn’t possess the frame or twitch for it. He appears to lack the bend and sink to play in space laterally. An outside linebacker must have some coverage skills: a smooth back-peddle and the flexibility to turn and run with a tight end or a running back out of the backfield. But most importantly, an outside linebacker has got to put pressure on the quarterback with a fierce pass rush. A fast first step off the line of scrimmage is essential. The ability to “Dip & Rip” with the inside shoulder to gain leverage against the offensive tackle. A combination “Bat and Swim” move to defeat a hand punch. And at a minimum, advanced pass rush techniques like flattening around the arc, or a spin move, are required at the collegiate and eventually the pro level. Johnson possesses a quick first step and demonstrates an impressive bull rush where overmatched high school opponents lack the mass to anchor against him. There is not much evidence on tape of his ability to anchor, because he wasn’t asked to do much of that in high school. As he gets bigger playing the 5-Technique with his hand in the ground, holding a point and/or setting and edge will become his primary responsibilities. As with most uber-talented high school kids, he has technical flaws that need some work. He comes out of his stance and plays too high. He needs to work on using his hands better to shed blockers and defeat hand punches. These are correctable issues with collegiate coaching. The speed of big-time D1 football is slowing down for Johnson because he is one year into his learning curve. He is a high end athlete with the potential to carry a first round NFL grade (6-5 / 270-290 Lbs. <5.0 – 40-clock). If he takes the classroom work out onto the field and applies himself, he has All-Conference/All-American ability.